A spectacular ceremony was held on the lead vessel of the icebreaker project 21900M in St. Petersburg on 23 September, forming part of the NEVA 2015 Programme. Guests and dignitaries came together to witness the official flag-raising ceremony on board the icebreaker 'Vladivostok' and to celebrate all those involved in the project. The diesel-powered icebreakers 21900M project, a modification of project 21900, was laid down at the Vyborg Shipyard in October 2012. 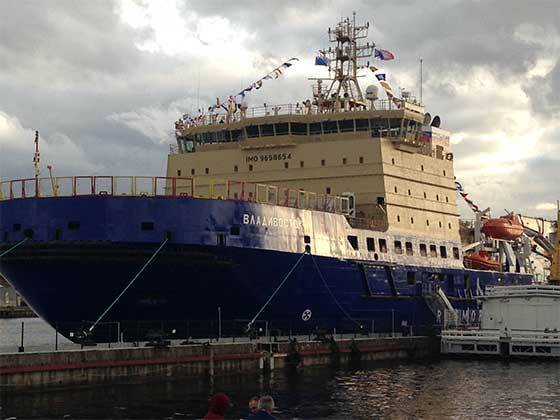 'Vladivstok' is the lead vessel in the series of three diesel-electric icebreakers built for FSUE Rosmorport and classed by the Russian Maritime Register of Shipping. Vyborg Shipyard PJSC is one of the largest shipbuilding companies of the North-Western Region of Russia, with 65 years' experience in shipbuilding, and a member of the United Shipbuilding Cooperation. General Director of Vyborg Shipyard, Alexander Solovyev, gave a warm welcome to the crowd saying, "The icebreaker will go on with its tests and will be officially delivered to the customer in October 2015." Deputy Minister of Transport of Russia, V.A. Olersky gave a short address explaining that the vessel is destined for operation in the Baltic. He then presided over the official raising of the national flag on the deck of the 'Vladivostok' while the assembled band played and the sun started to set, a very fitting pinnacle to the NEVA 2015 Programme and a week focused on Russian maritime excellence and business opportunity. The 'Vladivostok' is able to overcome ice thickness of up to 1.5 meters and her main purpose is the independent escorting of large capacity vessels, towing, extinguishing fires on floating facilities and other structures, providing assistance to ships in distress, and the transportation of cargo. The second icebreaker in the project 21900M is currently under construction in cooperation with Arctech Helsinki Shipyard.